The federal government is contributing $25.8 million from its Disaster Mitigation and Adaptation Fund towards the replacement of a submerged, aging drinking water pipeline in the Yellowknife River. Most communities in the Northwest Territories are near water, with some designated as flood zones. 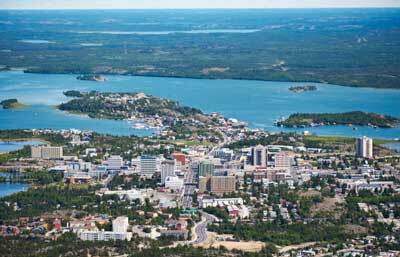 In Yellowknife’s case, the new upgrades are aimed at increasing the capacity for flood water retention and better protecting the community’s drinking water supply during times of extreme weather. The changes will also help reduce greenhouse gas emissions from water line replacement and system operation. The new 8.5-km drinking water line also means that Yellowknife can avoid drawing water from the region of a nearby, toxic former gold mine. “Approval of the City’s Disaster Mitigation and Adaptation Funding Application, with the support of the Dene First Nation and the North Slave Métis Alliance, represents a significant investment in the City’s structural and natural capabilities to mitigate the economic, environmental and social impacts of climate change,” said Yellowknife Mayor Rebecca Alty, in a statement to media. “With this funding, Yellowknife will be better able to respond to natural disasters and extreme weather events,” she added. A 2017 report prepared by engineering firm Aecom found that the current Yellowknife River pipeline that carries water from Pumphouse 2 at the river, through Yellowknife Bay, to Pumphouse 1 in the city, is “reaching the end of its useful life”, so the City needed to either replace the pipeline or use Yellowknife Bay as an alternate water source. Prior to 1968, Yellowknife obtained its drinking water from the bay, which is connected to Great Slave Lake, but the City switched it water source to the Yellowknife River in 1969 over concerns about arsenic contamination from the Giant and Con mines. The Aecom report stated that while water treatment options exist to remove arsenic from Yellowknife Bay, processes such as reverse osmosis would not be feasible because of residuals disposal issues and high operation and maintenance costs. “An adsorptive media system would provide some removal of arsenic, but may have difficulty removing enough arsenic to meet drinking water quality guidelines at some of the high arsenic concentrations estimated to occur during upset conditions,” stated the report. Yellowknife is still looking to come up with about $9 million for its share of the water line replacement project, which has become a challenging task as it looks to make its new municipal aquatic centre vision — which could reach $50 million — a reality. “Because of climate change, extreme weather events are becoming more severe and more frequent, and they are doing more damage and [costing] more money,” said federal Minister of Public Safety, Ralph Goodale, regarding the funding announcement. “By investing in infrastructure that protects our neighborhoods, businesses and families, we are building communities that will be resilient to future natural disasters and prosperous for generations to come,” he added.